Once the diagnosis of Tuberculosis was confirmed, Wilson headed home to bed. He only rebelled once, when Miss Souper came to call. She had, quite by chance, taken a job as matron at a Cheltenham school and so called for tea. Even in bed, however, Wilson continued painting. He had become interested in the blurring of colour boundaries in Nature and produced the first in a series of colour studies. He was constantly delighted by the fact that the colours that could be seen were very often those that prejudice suggested were not ‘supposed’ to be there. After a week in bed Wilson felt better and was considered strong enough to go to the The Crippetts. Wilson spent his time in drawing and painting the countryside that was dearest to his heart, producing the most astonishing studies of Cotswold wildlife. Often he would sit in the woods at dawn, wrapped in his cloak, observing the natural world, with “Modern Painters, the New Testament and a good deal of pain” for company. He wrote that the thought that death was within “measurable distance” brought him “extra-ordinary peace of mind”. The vibrancy of his painting suggests that Wilson was far from morbid however, and that he was starting to make real progress with his painting. He was often joined for short botanical walks by his sister, Pollie and by Miss Souper. No doubt they also kept an eye on his general welfare, Miss Souper acquiring the epithet of “the useful help”. Since he couldn’t wander as much as he liked, Wilson collected an array of pets: newts from The Crippetts pond, a grass snake, and a young native squirrel which he named ‘Puggie’. The latter was full of fleas and much to Wilson’s delight chewed up his sheets to make a nest. As the Cotswold Spring unfolded before him in all its glory, Wilson was supremely happy pottering with his paints. Wilson’s Crippetts idyll was interrupted by an invitation, through some family friends, to go and stay in Norway for the summer. The main thrust of tuberculosis treatment at this time involved plenty of rest and cool, dry air. Dr. Rolleston thought that the air of northern Norway was as likely to be as good as the air of Switzerland and so Wilson’s trip to the sanatorium at Davos was postponed. He was soon in Norway, just south of the Arctic circle, staying near to modern day Brønnøysund. Here Wilson found a new kind of freedom, with no social expectations tying him to meals nor anyone waiting on him hand and foot. He could do more or less as he pleased and so delighted in tramping the vast areas of moorland and forest collecting specimens and sketching. Nevertheless, the country was so vast that he often gave up walking and simply collected and drew the plants and flowers. Quite apart from his deteriorated health, which often kept him awake coughing all night, he found the clouds of mosquitoes and horse-flies something of a challenge. Nevertheless, the ascetic self-control which he had achieved by this time may be seen in the fact that he was able to sit and sketch mosquitoes as they bit him, a feat that few naturalists have achieved. Often he would sit in a cloud of biting insects, wrapped in clothing and surrounded by tobacco smoke, his hands and legs swollen with bites, sketching the shifting colours of the long summer twilight. Wilson returned to Cheltenham in August and was soon at The Crippetts once again, walking and sketching with his sister and Miss Souper. He particularly enjoyed walking to Gloucester to sketch the Cathedral as he admired its Romanesque elegance. Nevertheless, his tuberculosis was not clear and so in October, Wilson was dispatched to the sanatorium at Davos in Switzerland, as had originally been planned. The Sanatorium was something of a shock to Wilson. His doctors insisted that he should do nothing. He tried to view his enforced idleness as a penance but he kicked against it at every opportunity. Perhaps as a result, he found the first snow somewhat depressing but soon came around to the challenge of trying to sketch the Alpine scenery and the complex colours of snow. His morale was further boosted through his correspondence with Miss Souper. Wilson would sit in his fireless room, with the ink freezing in the bottle, to read her letters and write his replies. He lost so much weight and became so frail that the doctors finally agreed to let him take some exercise. Wilson took full advantage, walking high into the Alps whenever he could get away with it. He also enjoyed skating on the lake. Nevertheless, Wilson had to endure periods of inactivity during which he read and meditated upon the life of St. Francis or sketched. It was during this time at Davos that Wilson consolidated the principles of ascetic mysticism by which he lived his life. It was here too, that he fully developed a colour memorisation technique that he had first conceived at Cambridge and which now came to fruition. It meant that he was able to make pencil sketches with colour notes and accurately paint up the picture later. It took quite a bit of practice and to begin with he often got things wrong but the one thing that Wilson now had time for was to practice his artistic techniques. As Spring came to the Alps and the birds and animals returned to the mountains, Wilson’s strength began to return. He was allowed to wander far and wide and sketched almost continuously. He carried out series of colour studies that were critical to his artistic development, as he continued both to perfect his colour notation technique and his experimentation with colour. His progress meant that he was better able to capture the fleeting moment of brilliance in an alpine sunset. It was with some relief however, that in May he left the medical regime of Davos and headed home. Wilson’s brief Spring visit to The Crippetts was again interrupted by an invitation to visit Norway. Still not fully recovered from the tuberculosis, he was rapidly on his way northward again and was soon sketching the vibrant colours of the Arctic twilight, in another series of colour studies. He picked up Sparrowhawk and Eagle Owl chicks as pets, along with a fox cub. These he drew in a series of pencil sketches that were later greatly admired by Thorburn and Lodge. However, the fox cub escaped and the Sparrowhawks were eaten by the Eagle Owls, so in all it was a somewhat eventful summer. It was crowned by Wilson cutting his leg whilst out in the woods sketching. The cut became infected and so he was forced to return to Cheltenham, taking with him a pet buzzard. Once again he repaired to The Crippetts where the buzzard caused general chaos. It eventually found its way to join the kite in the London Zoo. In early October Wilson returned to London to take up his interrupted medical studies. Once again he took rooms in Paddington but his cough returned with a vengeance and he returned to Cheltenham. It did concentrate his mind on one aspect of his life, however, and he and Miss Souper were soon engaged to be married. Both Wilson and Miss Souper were delighted with this somewhat unexpected turn of events. Wilson returned to his medical studies once more, this time taking lodgings at Stanmore in order to avoid the pollution of London. He now had two months before he had to re-sit the second part of his MB exam and eighteen months work to catch up on. It is of considerable credit that he managed to pass. He then worked on writing up his thesis, Yellow Atrophy of the Liver. 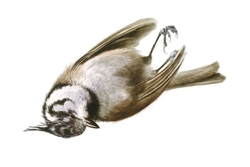 It was whilst at Stanmore that Wilson took a long hard look at his Natural History drawings and decided that anyone could paint or draw a dead bird in a classic Victorian-style plumage study. What he really wanted to do was to be able to capture the essence of the live bird on paper. He therefore set out to re-teach himself to paint and draw. At the same time he started to execute illustrations for The Lancet and Land and Water, although Wilson had come to dislike selling his paintings preferring to give them away. Wilson also returned to drawing at the Zoo. Here he came to the attention of the Secretary of the Zoological Society, Dr. Sclater who invited Wilson to a meeting of the British Ornithological Union. He was subsequently elected as a member. It was at meetings of the Union that he met Thorburn and Lodge, who admired and criticised his work and he theirs. Wilson also met with the bird artist Mr. Hammond, who was something of a recluse but Wilson thought his work to be inspiring and considerably superior to that of Thorburn. Despite discouragement from his father and from Lodge, Wilson was considering the idea of giving up doctoring and becoming a professional artist. He still craved proper art lessons, or even to see a ‘real’ artist at work. Nevertheless, his ‘profession’ won out over his ‘hobbies’, once again and he acquired a post as a locum at the Cheltenham General Hospital . It didn’t last long. In June 1900 Wilson received the most astonishing letter from Dr. Sclater, informing him that the post of Junior Surgeon and Vertebrate Zoologist was available for the forthcoming British National Antarctic Expedition and that he would be a suitable applicant. Wilson was utterly astonished. He was eventually persuaded to apply and successfully passed his interviews. He was taken on against medical advice and at his own risk but no-where else had they managed to find the unique combination of skills which Wilson represented. 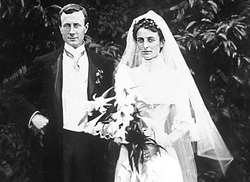 Three weeks before the Expedition sailed, Wilson married Oriana Souper. Their honeymoon was dominated by Antarctic preparations but they were blissfully happy.